What are the benefits of Freeze-dried? Simply put, freeze dried food is the best option for eliminating moisture and oxygen while preserving nutrients, flavor, taste, color and aroma. All our food items are carefully packaged and sealed to eliminate oxygen and prevent the re-absorption of moisture. This preservation method and our packaging processes allow our products to be stored without refrigeration, and be shelf-stable for up to 25 years… Our food not only tastes the best, but also provides you and your family with a high level of nutrients, vitamins, and minerals. Heavy-duty mylar pouches generally have a 7-10 year shelf-life, and are both compact and portable. 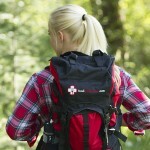 This makes them ideal for outdoor use and on-the-go convenience. Food-grade #10 cans have up to a 25+ year shelf-life and are perfect for long-term home food storage. Our products can be prepared (re-hydrated/reconstituted) quickly and easily. Just add water and stir. Hot water is recommended for the fastest reconstitution time (8-10 minutes) and the best taste for most products. Simply put, our food is delicious! Few people enjoy eating the same thing day after day. Your emergency food solution should offer a variety of great-tasting foods that taste and look as fresh as homemade meals. Protecting the people you value the most with emergency food and supplies. 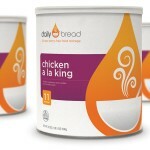 Better quality, better flavor… Taste the Daily Bread difference in your long-term food storage.